Recent mild weather in southern Manitoba is expected to raise Red River levels later this week, but not enough to prompt sandbagging in Winnipeg, the city says. 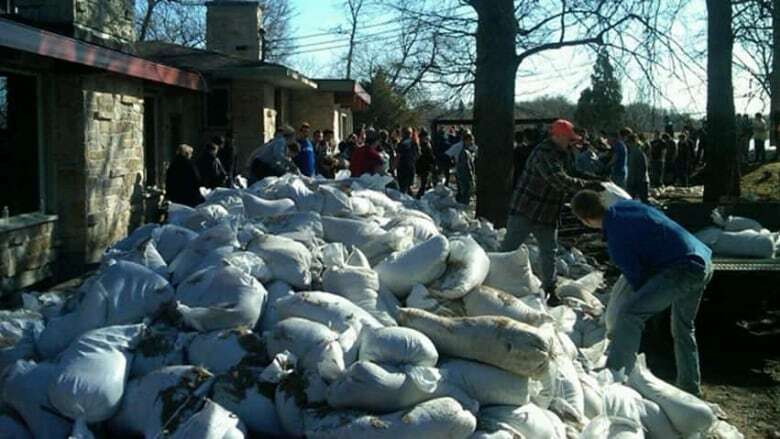 The City of Winnipeg says it does not anticipate a need for sandbags this weekend. The possibility of spring flooding is on city radar, however, especially after provincial flood forecasters identified a major risk of flooding on the Red, lower Assiniboine and other rivers in southern Manitoba. Manitoba flood forecasters will be watching the weather closely over the next two months, as the presence or absence of precipitation will determine the degree of flooding, provincial officials have said. "The city is actively preparing for the forecasted peak and has responded to an event of similar magnitude in 2009," Winnipeg's flood bulletin says. "Preparations include ensuring that all flood protection infrastructure is operable and activated, identifying at-risk properties and liaising with stakeholders." As of Tuesday morning, the Red River level at James Avenue was 7.8 feet, or 2.4 metres, above normal winter ice levels, the city said — a measure commonly referred to as "feet James." A second flood crest is expected in Winnipeg later this spring, once all the snow melts, at a level between 17.5 and 22 feet James, mainly because of ice. Weather will determine the eventual crest level. The upper edge of that range is in line with the flood crests on the Red River in Winnipeg in the 2009 and 2011 floods. The city will recommend sandbagging of some low-lying properties if provincial flood forecasters expect crests around 22 feet James.